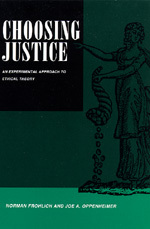 This book presents an entirely new answer to the question: “What is fair?” In their radical approach to ethics, Frohlich and Oppenheimer argue that much of the empirical methodology of the natural sciences should be applied to the ethical questions of fairness and justice. Norman Frolich was Professor Emeritus at the Asper School of Business at the University of Manitoba. Joe A. Oppenheimer is Professor Emeritus in the department of Government and Politics at the University of Maryland.